With our web-portal Fastback Extended, you publish your UV trade-ins towards hundreds of foreign dealers and car traders and you receive the best price bid. Your clients can also directly make trade-in requests by use of your website. Each request will instantly appear in your system. Once the trade-in was finalized, you transfer the vehicle to your UV stock by just a simple click. With just a few clicks you send your detailed offers to your UV trader list. You immediately receive the best price for the purchase of your vehicles. Moreover, by using the Fastback Trade platform, you will expand your prospection coverage area and receive hundreds of bids for the purchase of your vehicle. Fastback allows you to increase your new vehicle (NV) sales as well as your used vehicle (UV) sales thanks to getting the best bid prices. Save time by using our application ! You centralize your expertise reports and your trade-in requests on our secured servers. With a few clicks you access any document you may need. 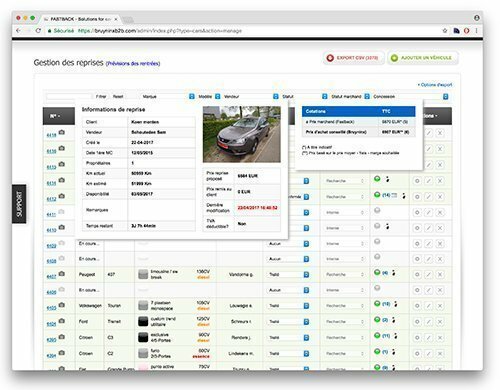 Thanks to the combination of Fastback Extended and Fastback Trade you get a solution to share your trade-in requests with hundreds of Belgian and foreign dealers and car traders with just one click. This way you will sell off your UV stock in much less time. Our application centralizes all bids received by the different car traders. Fastback Extended will help you choose the best purchase offer. We are at your disposal and at your service, fully complimentary, via phone or email 6 days a week between 9 am and 5.30 pm. You access the application where and when you wish to and this from any device (computer, tablet, phone). You can manage files and follow up on your company’s activity from your home or even from abroad in all security. 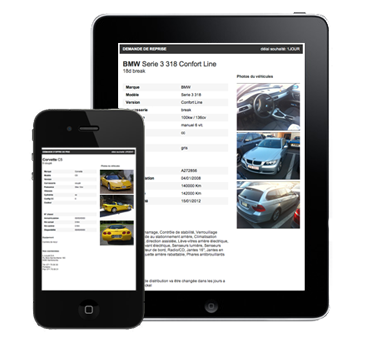 Fastback Extended is an ergonomically designed application developed by professionals in the field of automobile sales. Our application will help you save time in the management and publishing of your trade-in offers as well as in the organization of your UV trader list. Thanks to its simplicity in use you set up the platform yourself to make it fit your organization in the best possible way and you optimize your use of work-time. You need an innovating feature ? We’re at your disposal. Each step is well explained throughout a specific work process adapted to fit your dealerships way of functioning. Once the trade-in was entered in the platform, the system will handle sending the price quote requests to the various car traders. All this with one click ! Fastback Extended also generates and prints out all documents necessary for vehicle trade-in. Your documents are personalized to fit your company’s image (trade-in request, purchase slip, VAT certification, conformity declaration, etc.). Thanks to using Fastback Extended and its online connection with Fastback Trade, adding and managing UV traders was never this simple ! The centralized interface even allows your traders to receive a preview of your stock additions. You can personalize the preferences of each of your traders so they only receive offers that are likely to arouse their interest. One click will do to present the information to the interested traders. The offer will immediately be present in the system and the traders will be able to submit bids or decline the offer. You then receive electronic confirmation of the vehicle’s purchase to the convened conditions. You receive notifications by email for each trade-in request, price request or file change. In addition, you can directly get the trader’s bids on your smartphone and follow up on the evolution of your car dealership(s) at any given time. Fastback Extended offers a highly evolved data transfer system and a reporting module. 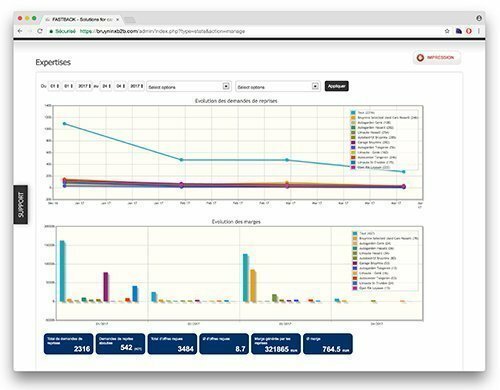 It reflects your sellers’, traders’ and dealerships’ performances in charts and tables. A daily email report is also sent to management. In conclusion, by using our reporting tool, you optimize the organization of your activity and of your partner selection. Fastback’s main strong points are its simplicity in use and its ability to adapt to its environment and to the internal functioning of car dealerships and large automobile groups. Without any intervention on our part you will tune the settings of vehicle file fields, add elements or make changes to the equipment and option list as well as to the technical and mechanical elements in the expertise system.